E V E RY S T U D E N T. E V E RY S TO RY. E V E RY DAY. S I N C E 1 8 9 5 .
to recognize someone who has an opioid addiction and how to look online to find out if people have received multiple opioid prescriptions, said Marian Wilson, WSU College of Nursing assistant professor. A Snap Fitness employee set up a GoFundMe page in response to damage caused by flooding on April 9. Snap Fitness Manager Kyle Jorgensen said the flood destroyed all the fitness equipment and shut down their business. He set up the GoFundMe page on April 12 and they have already received about $1,500. drian Gayles stared through the broken window. Mud and debris covered the floor and chairs and tables were turned upside down. He couldn’t believe what he saw. “It’s just heartbreaking,” he said. The 37-year-old is the co-owner of Rollys ice cream shop on Grand Avenue along with his wife Crystal Gayles. Last Tuesday night, he watched the Missouri Flat Creek flood devastate his store, Kool Nail Design and Spa next door and the rest of the businesses housed within the building at 745 N. Grand Ave. Heavy rain on April 9 caused the creek to flood and spill onto Grand, turning the street into a raging river. Long-time educator is recognized for his dedication to statistic majoring students. WSU track and field will compete in three meets starting with the Bryan Clay Invitational Wednesday. Price of parking on campus should be lowered by including it in all students’ tuitions. “It’s my hope and theirs that the federal government will provide a remedy that is fair to history,” Orlan Svingen says. He said although the gym is severely damaged by the flood, he is most concerned about the people. “It wasn’t a gym I was trying to save,” Jorgensen said, “it was a community.” He said the bond between members at the gym and employees at Snap Fitness inspired him to make the GoFundMe. “They don’t miss the equipment or the workouts,” Jorgensen said. “They miss the people.” They are still assessing the damages caused by the flood. They don’t know how long they will be out of business, Jorgensen said. The last time the place flooded was three years ago, he said, during the same month. They were out of business for over two months and they expect a longer recovery this time because it was more severe. “I was getting tired of waiting,” Jorgensen said. “I jumped the gun a little bit on the GoFundMe.” Jorgensen said he set the goal at $50,000 because that is about how much it costs to open a gym, which is what ownership will have to do. Community Calendar Tuesday 4/16 Latah Sanitation and Moscow Recycling will buy your aluminum cans from you, starting today. During this week, Moscow Recycling be paying you for aluminum cans at a higher amount than normal. Price per pound will be determined before the event and updated on Moscow Recycling Facebook’s page. Moscow Recycling is located at 401 N Jackson St. in Moscow. Call (208)-882-0590 if you have any questions. Tuesday 4/16 Help celebrate local poetry at the April Poetry Relay tonight. Starting at 5:30 p.m. in the Council Chambers of Moscow City Hall, the city will celebrate National Poetry Month with a “relay” of poets. Bloom will provide appetizers, dessert and a no-host bar. The event is free and open to the public. Poets include opener Susan Hodgin and Robert Wrigley, event closer. To submit, email events to meditor@dailyevergreen.com. Preference will be given to events that are free and open to the public or are hosted by an RSO, and must include time, date and place. Police log Sunday Missing Person SE McKenzie Street, 7:32 a.m. Officer responded to the report of a missing person. Subject was located. Stray Animals SE McKenzie Street & SE High Street, 1:06 p.m. Officer responded to the report of a stray dog. Accident Non-Injury NW Arcadia Drive, 1:44 p.m. Officers and fire responded. One subject was warned for hit and run of an unattended vehicle. Malicious Mischief NE Kamiaken Street, 9:45 a.m. Officer responded to the report of vandalism. Noise Complaint NE Merman Drive & NE Westwood Drive, 3:12 p.m. Suspicious Person/Circumstance Officer responded to a noise complaint and SW Fountain Street, 11:01 a.m. checked the area. Unable to locate. Officer responded to the report of a suspicious person. Business or License Problem 3200 Airport Complex North, 3:21 p.m. Accident Hit and Run Officer responded to the complaint of an NE Skyview Drive, 11:46 a.m. unauthorized ride share vehicle. Unable to locate. Officer responded to the report of a hit and run collision. Litter/Pollution/Public Health NW Park Wood Drive, 3:34 p.m. Noise Complaint Officer responded to the report of a couch NW Ventura Drive, 12:21 p.m. Officer responded to a noise complaint. being dumped. Officer was able to contact Officer was unable to locate upon arrival. the suspect and have it removed. In the Stars | Horoscopes Today’s Birthday —— Raise your skills and expertise through travel and education this year. Dedicated focus builds your career status and influence. Domestic joys delight your family this summer, inspiring new professional directions. Your work and career flourish next winter, inspiring changes at home. Develop an exciting possibility. Aries (March 21 - April 19) —— Disciplined practice matters with a physical goal. You’re exceptionally clever with communication over the next three weeks, with Mercury in your sign. Express your creativity. Taurus (April 20 - May 20) —— Build a romantic relationship through steady participation. With Mercury in Aries, review the past. Consider what worked and didn’t, and update plans. Plot a new course. Gemini (May 21 - June 20) —— Participate with an energetic team over three weeks, with Mercury in Aries. Your friends are a source of inspiration. Provide leadership, support and diplomacy. Cancer (June 21 - July 22) —— Stay involved with your community and networks. Share valuable professional opportunities. Mercury in Aries emphasizes career gain through communications. Monitor a larger conversation. Leo (July 23 - Aug. 22) —½— Can you mix business with pleasure? Travel beckons, with Mercury in Aries for several weeks. Make longdistance connections. Study and research are favored. Virgo (Aug. 23 - Sept. 22) —½— Use your power for good. It’s easier to organize shared finances, with Mercury in Aries. Pay bills and figure out how much you can spend. Libra (Sept. 23 - Oct. 22) —½— Communication between partners, lovers and allies flowers, with Mercury in Aries. Compromise and negotiate terms. Delegate more. Remind someone what you appreciate about them. Scorpio (Oct. 23 - Nov. 21) —— Coordinated teamwork leads to success. What you’re learning energizes your work, health and fitness, with Mercury in Aries. Discover efficiencies and best practices. Sagittarius (Nov. 22 Dec. 21) —— Charm benefits your career. Express your affection and heart. Put your love into words. Romantic communication flowers over three weeks, with Mercury in Aries. Capricorn (Dec. 22 - Jan. 19) —— Begin a home renovation phase, with Mercury in Aries. Set family goals. Clean house and organize. Release stuff that no longer “sparks joy.” Hold a garage sale. Aquarius (Jan. 20 - Feb. 18) —½— Learn voraciously, with Mercury in Aries. You’re especially creative, and words flow with ease. Write, record and report. Create beautiful images, sounds and movements. Pisces (Feb. 19 - March 20) —— Discover new income sources. Track your cash flow for growth. Make profitable connections, with Mercury in Aries. Benefit through communications, collaboration and networking. T he Daily Evergre en is the of f icial s t u d e nt p u b li c ati o n o f WSU, o p e r atin g u n d e r au th o r i t y g r a nte d to th e St u d e nt M e d ia B o a r d by th e WSU B o a r d o f R e g e nt s .
R e sp o nsib ili ti e s f o r e s t a b lis h in g n ew s a n d a d ve r tisin g p o li ci e s a n d d e ci d in g issu e s r e l ate d to co nte nt r e s t s o l e l y w i th th e s t u d e nt s t a f f. T h e e d i to r a n d a d ve r tisin g m a n a g e r p rov i d e r e p o r t s to th e St u d e nt M e d ia B o a r d at m o nth l y m e e tin gs . Co nt a c t Tr a c y M il a n o at 335 - 4573. 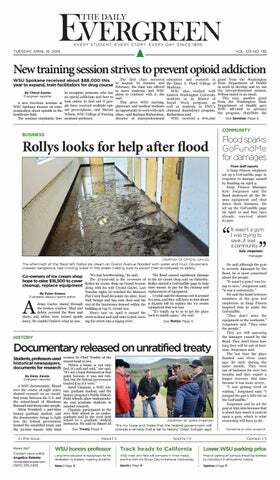 Contac t News Editor Angelica Relente at 335-2465 or news@ dailyevergreen.com. Contact Trac y Milano at 335- 4573. Email Editor-in-Chief Luke Gersmehl Hudson at editor@dailyevergreen.com for more information. Co nt a c t Ad ve r tisin g M a n a g e r Cl ay to n Fin ch e r at 335 -1572 . 335-1140, desports@dailyevergreen.com T h e g ove r n in g “ St ate m e nt o f Po li ci e s a n d O p e r ati n g B y l aw s ” is av a il a b l e at St u d e nt M e d ia’s a d m in is t r ati ve o f f i ce s in M u r row E as t ro o m 113. St u d e nt M e d ia‘s d ir e c to r is R i ch a r d M ill e r.
N e w s f a x : 335 -74 01 Co p y r i g h t © 2018 W SU St u d e n t Media Board. All WSU Student Media ar ticles, photographs and graphics are the property of the WSU Student Media Board and may not be reproduced without expressed writ ten consent. Postmaster: Send address changes t o T h e D a i l y E v e r g r e e n a t P. O . B o x 6 42 510 , P u l l m a n , WA 9 916 4 -2 510 . F i r s t- c l a s s s e m e s t e r s u b s c r i p t i o n s a r e $14 0 i f m a i l e d d a i l y ; $9 0 i f m a i l e d w e e k l y. O n e - y e a r s u b s c r i p t i o n s a r e $2 2 0 i f m a i l e d d a i l y, $16 5 i f m a i l e d w e e k l y. U S P S P e r m i t N o . 142 - 8 6 0 . Fi r s t c o p y f r e e, e a c h a d d i t i o n a l 50¢. A WSU regents professor in the School of Economic Sciences, Ron Mittelhammer, received the V. Lane Rawlins President’s Award for Distinguished Lifetime Service for his dedication to bettering the university. “I am thrilled to win this award,” Mittelhammer said. “I never expected it, but it happened, and I am so glad to have it.” Jill McCluskey, professor for the School of Economic Sciences, said Mittelhammer always wants to make things better at WSU. A WSU researcher found that a chemical used on the roads during snowy weather has dangerous, and hidden, effects on the health of roadways and bridges. Xianming Shi, WSU civil and environmental engineering associate professor, found that samples of concrete exposed to magnesium chloride with repeated freeze and thaw cycles lost more strength than samples exposed to rock salt. Deicers work by reducing the freezing temperature of water, Shi said. “There is a good reason why we use salt,” he said. “We want winter safety and we want to drive fast on winter roads. But that leads to a lot of unintended consequences.” Shi said the most concerning finding was the fact that the samples with damage showed no visual signs of it. “One alarming finding is that our traditional inspection methods are failing the purpose,” Shi said. JOSEPH GARDNER | THE DAILY EVERGREEN He said this finding is similar Xianming Shi, associate professor for the School of Civil and Environmental Engineering, to humans being sick. If there are visible symptoms someone can go discusses the use of magnesium chloride as a deicer Friday in Sloan Hall. to the doctor before the problem gets out of hand. This work was funded by the U.S. and Oregon Department of Transportation. Shi said Oregon is unique because they rely primarily on magnesium chloride deicer instead of a combination of methods. He said magnesium chloride is thought by some to be more environmentally friendly; however, this is still debated. It is difficult to quantify the risk because it can vary based on the receiving environment. Art Garro, City of Pullman maintenance and operations superintendent, said Pullman currently uses magnesium chloride, but the amount used has been reduced over time. “We have cut back on what we use, but there are certain things that magnesium chloride — you just can’t beat it for what you are trying to do,” Garro said. Magnesium chloride works well for getting rid of black ice, in particular, Garro said. If the city uses solid rock salt there is nothing to bind it to the road and the salt gets pushed to the side of the road. Shi’s worked on deicer research previously, but his study in 2003 only examined whether certain deicers affect water quality adjacent to roads. WSU Track and Field Director Wayne Phipps talks about the team’s strengths and challenges looking forward on March 9 at the WSU Mooberry Fields. The Cougars will compete in three different meets starting on Wednesday. SU track and field will travel down to the Los Angeles area to compete in multiple invitational meets this week. Baumgart finished just outside of the top-50 in a tie for 51st place. Chu will be looking to carry over her impressive day one performance to the next two days, while her other teammates will be looking to make up for the high stroke count. With two more days left in the Pac-12 Championships, the Cougars still have plenty of ground to cover but are sitting in a good position after one round. The Cougars are placed one position higher than where they finished last year and are one position above UW. While the team collectively is positioned higher, so are each of the players that are returning from last year’s championships with the lowest ranking Cougar this year starting at No. 51. The Pac-12 Championships will resume all day today followed by the final round on Wednesday. Those who need to arrive daily to the Pullman campus by car are charged hundreds of dollars just to be able to park. The WSU buses are an option for some, but where they run and for how long limits their effectiveness and some students need cars just to get to school. necessarily those of The Daily Evergreen staff, management or advertisers, or the WSU Board of Regents. The Daily Evergreen subscribes to the Code of Ethics set forth by the Society of Professional Journalists. 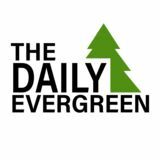 News planning meetings of The Daily Evergreen are open to the public. Persons interested in attending news planning meetings may email editor@dailyevergreen.com or call 335-3194 to arrange an appointment. Congress shall make no law respecting an establishment of religion; or abridging the freedom of speech, or of the press; or the right of the people peacably to assemble, and to petition the government for a redress of grievances. Editorial board Luke Hudson, editor-in-chief Sydney Brown, managing editor Angelica Relente, news editor Madysen McLain, deputy news editor Kade Russom, opinion editor Email opinion@dailyevergreen.com to share issue ideas with the editorial board. versity affiliation (if applicable) must accompany all submissions. Letters and commentaries should focus on issues, not personalities. Personal attacks and anonymous letters will not be considered for publication. The Daily Evergreen reserves the right to edit for space, libel, obscene material and clarity. The views expressed are solely those of the individual authors. Seminar | Continued from Page 1 curriculum and train facilitators, she stated in an email. A team of WSU professors worked on the class curriculum: Richardson, Wilson, Brenda Bray and Connie Remsberg, clinical assistant professor in pharmacy and pharmaceutical sciences. Wilson said students from different programs must learn how to work together because one provider alone can treat someone based on their knowledge, but collaboratively, they have a lot more expertise. A provider, Wilson said, is a medical doctor, physician, nurse practitioner, physician assistant or even a pharmacist, if the pharmacist writes prescriptions. Wilson said physicians should consult with pharmacists to know the best medication to give a patient. They should work with social workers to help patients who have an issue that might need counseling. Richardson said students work on their communication skills and talk about roles and responsibilities in the class. The main goal is to learn how to communicate with other health professionals on this topic, she said. “The nurse might assume that COURTESY OF ROBERT HUBNER the pharmacist is going to do Students from several universities, like WSU and Eastern Washington University patient education around taking opioids, and a pharmacist might discuss with each other about opioid addiction and how they can prevent it. assume that a nurse has already taken time to sit down with a patient and help them understand the risks of taking opioids,” Richardson said. One problem with pain management, Wilson said, is providers give patients opioid pre-scriptions because many of them do not have the education to know what else to do. This issue is exacerbated because people with an opioid addiction may get medication solely because they are addicted, not because they are in pain, she said. “Patients alone are not responsible for their addictions. Sometimes, healthcare, I think, allows people to become addicted because we don’t address their underlying causes,” Richardson said. She said the class also focuses on the importance of not using stigmatizing language. As an example, Richardson said providers should not say that someone has “dirty urine.” They should say that a patient’s urine tested positive for a drug. “Even saying that anyone is addicted can sound stigmatizing to some because that makes it sound like addiction is a choice. Svingen said, but Chief Tendoy claimed the land as his in the cession document, and his claim is signed by four others. The research is being used to negotiate for land restoration or a land claim set-tlement between the mixed-band and the federal government, Svingen said. “It’s my hope and theirs that the federal government will provide a remedy that is fair to history, and fair to the mixed band,” he said. Climate | Cont. from Page 5 years, according to the Citizens’ Climate Lobby. It is considered revenue neutral; money collected through a carbon fee will be allocated equally to all Americans. It’s simpler to administer than other carbon pricing plans, so costs would be minimal. No money would go to the government. Interested readers can learn about these efforts and many more this weekend at Bridging the Climate Divide, a regional conference April 19 and 20 in Moscow, sponsored by the Palouse Chapter of CCL. Climate change isn’t limited to Washington State, nor to North America. It doesn’t respect political boundaries. We can move America to join the rest of the world by encouraging our representatives to support HR 763 regardless of political affiliation. With bipartisan support, the policy has a good chance of passage, with lasting, long-term effectiveness. Together, we can address climate change in unprecedented COURTESY OF PIXABAY ways, and at the same time protect and benefit most sectors of New plans for managing climate change are underway, but a national plan needs to be implemented in order for them to be as effective as possible. The Energy Innovation and Carbon Dividend Act is one possible solution to this issue. our economy. Tracy Milano at (509) 335-4573. Apts. for Rent Wil-Ru Apartments has 1 & 2 bedroom apartments available. Call 509-332-5631.
is only reasonable that a similar system should be put in use for parking on campus. The brunt of the cost would still be paid by those who choose to use it, but if even less than 5 percent of the price of a parking pass was spread through the tuition costs of WSU students, the effect would be deeply felt by those struggling with the price of parking. It would require a significant change in the structure of how WSU’s parking services are handled, but it would give those who need a personal vehicle on campus a break from the hundreds they might pay for this service already. Deyanira Tovar is a junior digital technology and culture major from Bellevue, WA. She can be contacted at 335-2290 or by opinion@dailyevergreen.com. IMMIGRATION-US Naturalization Fiancé, spouse or family visas. Green Cards. Call the Law office of Michael Cherasia. (208)883-4410; 220 E. 5th St., Room 311, Moscow. Please call 509-388-9008 for more information, including lease start dates. letes who compete well enough to make it there. “I think this is a weekend that simulates what we’re going to run into when we run into the Pac12 [Championships],” Phipps said. “Then to first rounds, then hopefully ultimately to NCAA finals where student-athletes are required to go back-to-back days. We’ll balance it out a little bit so that we won’t do too many events on any one day for any person.” The first meet will start on Wednesday at the Bryan Clay Invitational, transitioning to the Mount SAC Relays on Thursday and topping off the week with the Beach Invitational starting on Friday. Honoring those who advance leadership and engagement at Washington State University and beyond. Sophomore Michaela Bayerlova serves the ball during her match against Boise State March 24 at Hollingbery Fieldhouse. Bayerlova is the No. 1 singles player for WSU. WTA singles poll and has been ranked as high as 579th. Bayerlova’s numbers in the ITA Singles rankings are even more impressive. She is currently the 73rd women’s player in the ITA Singles rankings By Shawn P. and has seen rankings as high O’Connor as 69th. Evergreen columnist Michaela has already set records at WSU. As a freshman, Bayerlova set the program record for highest ITA DI rank. She also saw unprecedented Michaela Bayerlova had a success at the NCAA Singles flawless weekend, collecting two wins in the No. 1 singles spot for championship. Bayerlova, then-ranked No. 23 in the the Cougars. nation, knocked off No. 49 One 3-6 and two 6-4 set of Natalie Novotna of Virginia victories over No. 10 UCLA Tech in straight sets. The win on Friday helped seal WSU’s was the first tournament win biggest women’s tennis upset by a WSU singles player in in program history. Bayerlova program history. picked up a 6-1, 6-3 straightBayerlova would put up a sets victory on Sunday against valiant effort in the second No. 13 USC and was the only round, but fell 7-6(4), 3-6, 6-4 Cougar to grab a victory. to Ashley Lahey of Pepperdine Bayerlova, a sophomore University, the eventual NCAA from Germany, is an accomNational runner-up. plished tennis player. She is Michaela Bayerlova is in currently ranked No. 52 in the midst of a special career at the ITA DI Women’s Singles WSU. Her wins this weekend Rankings. Last September, she helped propel WSU to its largest received her highest ever rank upset victory in program hisand the highest in school history and earned her this week’s Evergreen Athlete of the Week. tory when she sat at No. 17 on the list in September. Shawn P. O’Connor is a junior journalism Michaela is also highly and media production major from Oak ranked on the world stage. Michaela is currently the 719th Harbor. He can be contacted at 335-1140 ranked women’s player in the or by desports@dailyevergreen.com.